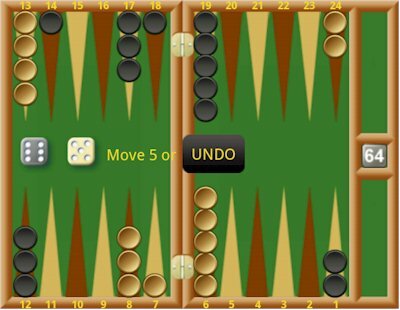 In addition to native iOS app for backgammon and android backgammon apps, GameColony.com offers a web browser-based modern Backgammon web app allowing you to play backgammon using any new browser - either on a desktop like Windows or Mac, or on a mobile device e.g. on iPhone or iPad or Android phone or tablet. You can download & install Backgammon Club app. You can download and install Backgammon Club app on most Android phones and tablets - even on Amazon's Kindle Fire and Blackberry 10! STEP 2 Proceed to your browser's "downloads" list and select downloaded "Backgammon Live"
Play backgammon online on Android phones and tablets for FREE or for $prizes. Interact, chat with real people, watch other people play, improve your skills and your rating. Play single or multi-point backgammon matches, invite players or respond to invitations, email games to yourself for later analysis. Internet connection required. WIFI connection is not strictly necessary - will play well with 3G connection. Automatically reconnects if connection is lost. Backgammon Club was tested on several modern Android Phones and Tablets as well as on different iPhone and iPad devices. There's a great number of simplistic and mindless mobile apps out there - from primitive shoot-them-up apps to games against robo-players. This Backgammon Club app for Android and Backgammon Live for iPhone/iPad is quite different - it is a social multi-player game uniting real people. 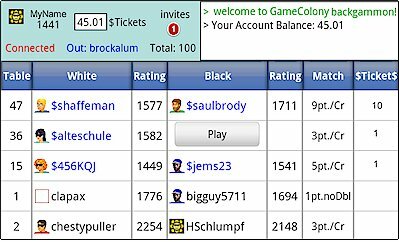 We hope that you find this multiplayer online Backgammon app from GameColony.com enjoyable and fun!